What are the foot rest under desk benefits you may ask? Improve circulation, get some energy out, improve your focus, and more when you use a foot rest under your desk. Having an office footrest while you lounge comfortably in the Ergonomic Office Chairs completes your lap of luxury. 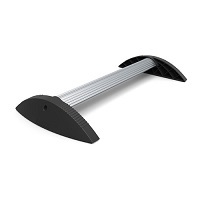 Choose from several office footrest models, including the rocker footrest, adjustable footrest for desk jobs, and a massaging footrest with rollers. The AlphaBetter Desk has a foot swing built in for students that also need to increase activity and get energy out while sitting in class. Having ergonomic foot rests in the office will improve the well-being and productivity of those sitting behind the desk for hours on end. Discover comfort with all of our Office Comfort products, like seat cushions and backrests for office chairs.